New Genalex kt77 in my amp. How much burn in time is required? Not liking what you are hearing? They sound very nice, but curious to when they stabilise. Set them at .40ma for now. Depending on where you buy your tubes, they may be already burned in. I'll have to check, but seems like 24hr burn in was what I read. I don't discount that electronic components might "burn in", however I think it's at least as much of a factor for your ears/brain to adjust (within limits). additional time will not make a significant change in the tubes sonic signature. I do however believe ones ears and brain may need to become accustomed to the sound. I have never really noticed that. Mine go til they blow. 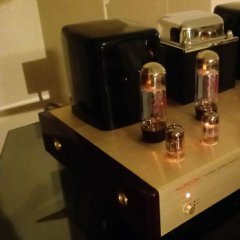 What would be a good bias setting for these GL kt77 tubes? The bias setting is generally determined by the designer / builder and listed in the owners manual of the amplifier in question. "Generally" tubes biased hot equates to stronger overall output, more bottom end but at the expensive of clean headroom and early breakup. Biasing cold the amp can become thin sounding, anemic with bass sounding a little weak but with cleaner headroom with later breakup. to the engineer of the product or at least an engineer from the company of said amp. Under the Jones bias table it calls for .37ma with 485v on the plate. I usually bias kt77/EL34 at .38ma. Currently bias at .40, but will be resetting tomorrow to a lower value. You are spot on, the manufactures of "some" amplifiers goose the bias to bring up the power stated or advertised but may not result in a pleasing sound to the customer. I also refer to the Jones table as well, good information. Personally I feel after looking up your AP-900 (if I am correct) that you may benefit more with changing the 4 x 6N1 and 2 x 12AX7 if you already haven't. NOS are great and even current GL 12AX7 would really help in the holographic imaging of the amp as the GL 12AX7 excel in that department with many pieces I put them in over the last 5 years. I recently was told by an amp maker that he burned-in new tubes for 40 hrs, and that they needed another 60 before being at their best. I can neither confirm nor deny that from my experience. I am currently using a Maple tree pre with 12sn7's. Not sure if this bypasses the internal pre on the Audcom or not, but I do have 12ax7lps sovteks in the Audcom. Still have the 6n1's in it. Many mileson those. Many feel that most of the better dealers or manufacturers will burn in tubes, not just for sound but for characteristics of matching or failure. I accept this as true, but reemphasize that I was told 100 hours for ideal sound. What would I replace the 6n1's with? 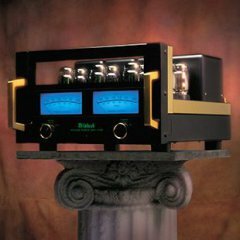 I'm not sure any of those tubes would make any difference because I think the external pre may be bypassing the front end of this amp. If you are using stock Chinese 6N1P the JSC VOSKHOD 6N1P-EB are nice upgrade and affordable. The 12ax7 is the preamp tubes, but what do the 6n1's do? Would changing these front end tubes improve anything while using an external mapletree pre amp? Seems like changing tubes in the mapletree would make the only improvements. True, if you are bypassing the preamp section of your integrated the Mapletree preamp tubes would be best to concentrate on. Without seeing the schematics on the Ap-900 I have no idea what role the 6N1P play in the integrated. I have searched the internet but found no information on the AP-900.